1. Eligibility: The June/July Giveaway # 3 is open only to residents of Countries, States/Territories or any place where the participant can legally participate in such giveaway. Participant must be over the age of 18 at the time of participating. The entry will be considered void if there is any contradiction of any applicable law. The sponsor of BASN EbonBC200 is BASN (“Sponsor”). 2. 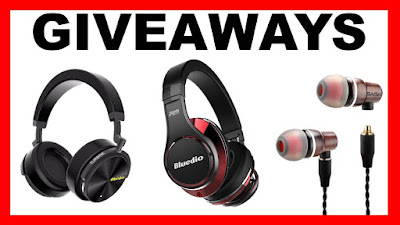 Prize: The Giveaway allows Entrants to enter random drawings, as described below, on the Salesberg YouTube Channel for a chance at winning headphones and earphones as described. The average retail value (“ARV”) of the Prize is AUD66. The total ARV of all Prizes is AUD200. THE ODDS OF WINNING THE PRIZE DEPENDS ON THE TOTAL NUMBER OF ELIGIBLE ENTRIES RECEIVED. 3. Giveaway Period: The Giveaway shall begin on June 2nd shall end at 15th July 2018. 4. How to Enter: To enter the Giveaway you must (a) subscribe to the Channel (or be already subscribed), (b) make the entry at the stated Gleam.io page. 5. Winning: The winner of the giveaway will be announced on 15th of July 2018 on Gleam.io Platform. 6. Prize Claim: The winner will need to claim their prize from the Gleam.io platform. Failure to respond timely, or to provide information for postage or other request to comply with the terms may forfeit the winning. If a Prize goes unclaimed or is forfeited by the Winner, the Prize may not be re-awarded. 9. Manufacturer: This is not a sale, nor a purchase. Manufacturer is at its sole discretion to provide any service or warranty on the products. A request may be made directly to the manufacturer, without any obligation on the manufacturers part to respond.